SDT 7.1 demo version HTTP 36 MB (SDT and FEMLink without restriction but no source code). SDT 7.0 demo version HTTP 36 MB (SDT and FEMLink without restriction but no source code). For compatibility with MATLAB version see the compatibility chart. This will open the license request building GUI shown below. Fill in the appropriate values and mail the result to license@sdtools.com so that a license key can be generated for you. To generate a license key, we require your professional coordinates and that of your reseller if any. 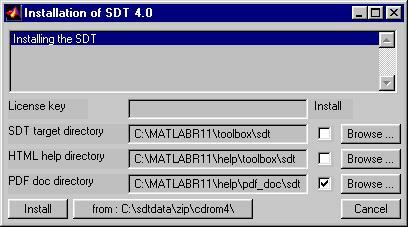 If you want to preserve a previous copy of the SDT rename the $matlabroot/toolbox/sdt directory. Start MATLAB, as a user who has write permission on the matlabroot directory (Administrator for Windows, root for UNIX systems). If you do not have write permission, see the server procedure to install on another directory. Select what you want to install, check that the target directories are correct. When ready press the Install button. Install extracts the proper files, checks the configuration of your installation of the SDT and edits toolbox/local/pathdef.m file so that the SDT becomes included in your default matlabpath. When ready press the Install button. Install extracts the proper files, checks the configuration of your installation of the SDT and edits toolbox/local/pathdef.m file so that the SDT becomes included in the your default matlabpath. To edit the default MATLAB path without adding a startup.m, run sdtcheck('path') then open the File:Set path ... menu and click Save. 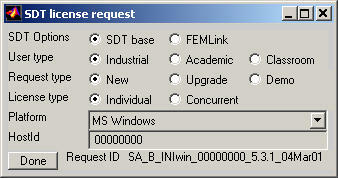 This edits the pathdef.m which, in a normal installation, is performed using sdtcheck('check') which requires write access. Version compatibility. Supported platforms ? The following lists supported MATLAB versions and platforms. To select a computer for use with SDT see see here. Most of the SDT code is .m files which are clearly open and extensible. Significant documentation efforts are made to detail the toolbox architecture so that you can easily extend it.